Situated in central France, north of the Massif Central, and focussed on the River Allier. The castle of Bourbon l’Archambault, as it became known from the Christian name borne by many of the early lords, is west of the Allier and also of Moulins, the later capital. 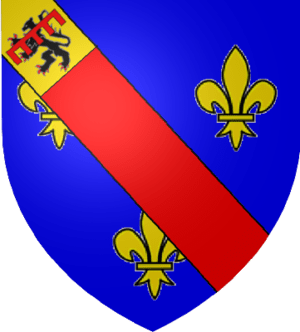 The first known lord dates from the late 9th century; his lands were in the border-zone between Berry and the Auvergne – the castle of Bourbon was in Berry and the Abbey of Soligny, where the lords were buried, was in the Auvergne. Berry had had no Count after the Carolingian era and the Auvergne later broke up, with the result that the Sires of Bourbon were able to exploit whatever opportunities came up without a powerful neighbour to spoil things. By the time the last of the original male line died in 1171, the Bourbonnais had reached the Loire to the east. His heiress married twice; her second husband, Guy of Dampierre, was a noble of Champagne. Their grandson died in Cyprus in 1249, leaving two daughters, both later married to sons of the Duke of Burgundy. In 1257 the elder inherited the Counties of Nevers, Auxerre and Tonnerre from her grandmother, and Bourbon passed to her younger sister, who in her turn left only an heiress, Beatrice, Dame of Bourbon, who married Robert, Count of Clermont, youngest son of King Louis IX. 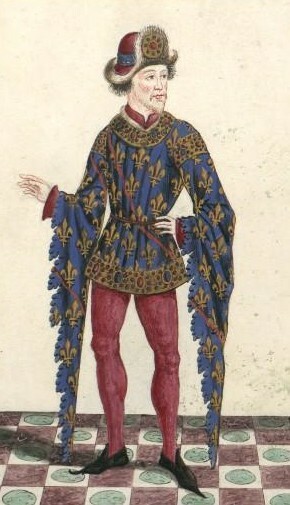 Their son, Louis I, succeeded his mother as Sire de Bourbon in 1310 and his father as Count of Clermont in 1318; in 1327 he exchanged Clermont for the neighbouring County of La Marche (though Clermont was shortly afterwards returned to Bourbon by the next King) and was elevated to be Duke of Bourbon and a Peer of France. La Marche later passed to a cadet line and then out of the family, though it was granted again to the last Duke of the senior line. Meanwhile the Dukes had acquired Beaujolais and Dombes (the latter across the Saône) by purchase, the County of Forez by inheritance in the late 14th century, and the Duchy of Auvergne, the most important of the broken-up lands of the Auvergne, by royal grant in 1425. The Duchess of Bourbon of the time was a daughter of John, Duke of Berry and Auvergne, who had died in 1416 without male heir. Three brothers were the last Dukes of the senior line. The last of them, Peter of Beaujeu, 1488-1503, left a daughter, Susannah, who became Duchess of Bourbon and in 1505 married the heir male of the Bourbons, her cousin, Charles, Count of Montpensier (a small Auvergnat lordship) and Dauphin of Auvergne. He thus became Duke by marriage and was later appointed Constable of France. Susannah died childless in 1521 whereupon the Constable’s right to the title was challenged by Louise of Savoy, granddaughter through her mother of Charles I, Duke of Bourbon, whereas the Constable was descended from Charles I’s younger brother. Louise had the disadvantage of not being the senior survivor in the female line, though she was the senior of those resident in France, but this deficiency was more than compensated by the fact that she was the mother of King Francis I, who anticipated some of the decisions of the courts and allowed his mother some of the lands. The Constable was provoked into treason, was deprived of all his lands in 1523, was restored after Francis I had been taken prisoner at the Battle of Pavia in 1525, and died storming Rome in 1527. Louise became undisputed Duchess of Bourbon until her death in 1531. Some of the lands were restored to the sister of the Constable; the senior male line, headed by the Duke of Vendôme, got nothing. A greater prize awaited the Dukes of Vendôme: in 1589 the then Duke, already King of Navarre through his mother, became Henry IV of France. The Bourbon dynasty was later to provide Kings for Spain (including the restored monarch of 1975) and for the Two Sicilies, Dukes for Parma, and in 1964 the Grand Duke of Luxembourg (though he kept the dynastic name of Nassau). The title of Duke of Bourbon was revived for the Prince of Condé, the senior Bourbon prince outside the royal line, in 1661. He had been a rebel, but the Great Condé was a mighty general, and it was decided to placate him. The Bourbonnais itself became a gouvernement, rather a small one. A governor was appointed in 1532, though at times in the 16th and 17th centuries the Bourbonnais was part of the larger gouvernement of the Lyonnais. In civil and financial administration, most of it was joined with parts of La Marche and the Nivernais to form the généralité of Moulins, though a small area was in that of Bourges. The Parlement of Paris had jurisdiction. In 1790 most of Bourbonnais became the largest part of the Department of the Allier, though parts of the province joined the departments of Cher, Creuse, and Puy-de-Dôme. This entry was posted in Cyprus, England, France, Italy, Luxemburg, Spain and tagged Auvergne, Bourbon, Bourbonnais, County of La Marche, Duke of Bourbon, House of Bourbon. Bookmark the permalink.